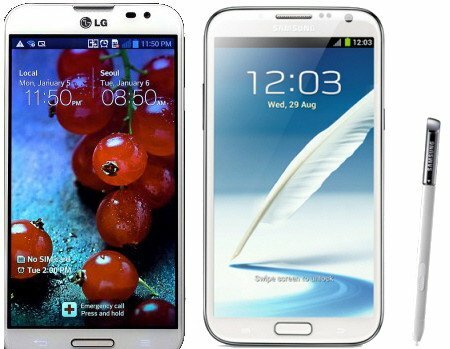 Is LG Optimus G Pro an Alternative to Galaxy Note 2? It is not a secret that LG wants to step into the phablet market which is dominated by Samsung’s 5.3″ Galaxy Note and 5.5″ Galaxy Note 2. The 5″ rectangle slab, Optimus Vu, and Vu 2, announced last year, failed miserably to get into this niche market. So, this year, LG Optimus G Pro was announced during Mobile World Congress 2013. It will be released in selected regions next month. This time LG gambles on the Optimus G branding. Will it be successful? The eye-catching feature of this phone is its 5.5″ full HD IPS display. So, the targeted competitor of Optimus G Pro is not Galaxy S3 or recently announced Galaxy S4. LG actually wants this phone to be the alternative of Galaxy Note 2. From the timing of the announcement, it can be easily deduced that Galaxy Note 2 is the target. By releasing a handset in the middle of Galaxy Note 2 and the coming Note 3, Optimus G Pro can get about 6-month lead in hardware specifications against Note 2. LG recently started to know how to design a great Android phone after they worked with Google for the Nexus 4. LG then transformed Nexus 4 into Optimus G, which is the most successful Android phone LG ever made. From the exterior, Optimus G Pro likes a sibling of Galaxy Note 2. It is totally different from Optimus Vu or Optimus G. Physical home button and two capacitive buttons for menu and back are similarly placed like that in Galaxy Note 2. However, Optimus G Pro has slightly smaller side bezels. For the back, LG also abandoned the all-glass design spotted in Optimus G. Plastic was chosen for Optimus G Pro. The build quality is similar to Note 2.